My final day involved some early-ish morning shots at Moonstone Beach, the Central Coast mood is best when the mists are all thick. Then, after picking up an exquisite coffee cake from Linn’s Bakery in, driving (and stopping) and driving home to LA. The coast from Cambria to Morro isn’t as dramatic as the wilds of Big Sur. But there are unique photo spots here if you keep your eyes open. And that’s what photography is after all, open eyes. In fact, a few miles south of Cambria, I noticed a large car pull-off area. I had planned to spend an hour or two exploring new photo spots in this section of coast. And this pull-off had a long apron of dry grassland leading down to a beach. Suddenly there’s an adventure. A pleasant morning on the Central Coast. No place you have to be. And the thought comes, let’s see this place fresh, as photographer with camera. I walked down the dirt steps and entered into the dry field. And at first you just want to breath in a place, get the smell of the grasses and the ocean spray. Listen to the insects in the grass. And if you’re in the moment, you may even sit down in the grass and take it all in. Why not. Walking the field, you start to see what makes Cayucos Point appealing. “Who are these men; what are they after,” the seals asked themselves. After Cayucos, it’s just a short jump to get to Morro Bay and it’s famous rock. This pull-off on the north side is my favorite view of the rock. Once you get to Morro Bay, the highway heads east to San Luis Obispo, past Pismo Beach, into wine country, west of Solvang, the mock Danish town, and all the way home. The unusual step architecture of the rock beach attracted me. I decided to go abstract. Monument Valley has been the embodiment of the American Southwest in the popular culture since John Ford began making his Westerns there (starting with Stagecoach). And the visual impact of the place has been drawing photographers even since. To fully access these unique shoot locations, a tour is a necessity. The landscape photographer Josef Muench photographed the area in the early days and throughout his career with Arizona Highways magazine. Muench’s images of the place were what Harry Goulding used in the 1930s to convince John Ford to shoot his next film there. Ansel Adams photographed there. David Muench (Josef’s son) just put out a nice Monument Valley photo book that’s a useful overview for anyone who wants location ideas. There are several unique shooting spots to Monument Valley: 1. the “View” location is on the hilltop where the hotel of that name is located. 2. The dirt road that goes into the tribal park takes general visitors to several other classic spots including John Ford Point (below). 3. Monument Valley tours go to places like Big Hogan and Ear of the Wind not on that main tourist road. 4. Locations like Mystery Valley, Tear Drop Arch and Agathlan are not in the main valley but are equally representative of this sacred place. For more images of Monument Valley. The dirt road into Monument Valley as seen from John Ford Point. Big Hogun, a location that’s covered on many of the tours. Mystery Valley locations (above) are just south of Monument Valley in a separate section of the park. This area includes that has some of the best ruins, ones originally built by the ancient Puebloans. This area also requires a tour to access. Creatively, the sweet spot for Monument Valley is to break the shot down to its simplest visual components, earth, monolith, sand, sky. Then remove every extraneous element. Essentials of Monument Valley, monolith and sand. Three Sisters, Monument Valley, Sunset. Shot out the back of the tour jeep. None of these compositions is too complex. But hopefully, the visual journey is clear. The huge stone columns and buttes carry much of the visual interest simply by being so iconic. That’s one reason so many of the structures seem recognizable, the Sisters, Totem Pole, Mittens, etc. Because each is so definitive, even archetypal, when strewn across this ancient valley. Of course, the photographer has to bring their own vision to the Valley, put elements into relationship, throw the monoliths into relief as light works its magic. Part of this skill is just showing up when the light is more distinctive, part is weighing the compositional elements thoughtfully. To me, Monument Valley is like a chess board populated by monolith, butte, mesa. As you cover the park, different elements come to the fore or retreat into the middle distance. Your work is to put these archetypal monuments into the context of a composition. The sand dune section, just west of Totem Pole, has the softest textures in the Valley, especially at sunrise or set. With photograph above, I found a spot where the mesa anchored a line of buttes receding into the sunset. To balance that relationship off, I shifted my location to include a twisted cedar, rooting the foreground into the composition. Agathlan. To emphasize the compositional elements (clouds, mountain, fence, field), I used differing LR tools for the differing sections. Agathlan, a volcanic plug on 163 between the Valley and Kayenta, has its own quiet power. I used the fence line and a simple Rule of Thirds structure to provide context. Here the foreground is a flat sand dune juxtaposed with receding monoliths. The sunset side-lighting adds depth. The Valley is high desert and if you go in the spring or fall, you’ll often find one “weather event” after another bearing down on you in the course of a day. That can make for less comfortable photo experience, maybe even damp clothing (oh, no). But harsh weather makes for a far more powerful image than the typical summer day — the image emerges out of wind, snow, light. This shot of the Valley “View” and the image of Ear of the Wind (below) take on some mystery because of the stormy conditions. Bare tree branches tear into a foreboding sky at Ear of the Wind. The image below is a solid composition but the dark clouds focus the eye towards the direction of the sunset, as does the play of light on the sand dunes and buttes. The storm blew over just soon enough to get a few images with attitude. But in the middle of that work, I had a conversation with one of the self-pub/epub vendors., ExLibris. Their sales rep caught up to me when I was on my way to Arizona. I’ll get to that later…. Some of these self-pub companies take a fairly aggressive approach. And I have no issue with them for being sales-driven. There are probably a hundred competent publishers in the US self-pub/ebook marketplace now. The biggest publishers are subsidiaries of Amazon and Ingram, the print distribution giant. The rest of the publishers do what they can to survive. For a narrow-cast writer like me, working with a big-five publisher can be a bad match (and yes, an improbability). So I need these independent publishers. I like the variety of business models they use. Some publishers who’ll do it all for you (except the writing). They do copy edit, layout, cover art — the stuff that gets the book in print, in eBook format, on Amazon, iBooks, Barnes and Nobles ebook site, etc. And the full serve folks don’t stop there. They will do the press release and distribution. They do marketing, special events. And if you pay them enough, you can get the royal treatment — and never cover your initial costs. Or you can work with Amazon’s or Ingram’s folks. And they want you to do almost all the heavy lifting. Though they are slowly expanding into the more full-service approach now. I do have years of background in business marketing and have no trouble calling and emailing media outlets for book PR. But I also want to off-load much of the grunt work to focus on the fun stuff, writing, travel and foto shoots. So I’ve ended up talking to the more full service folks and leveraging specific services if they offer a good price. Anyway, Antonio’s company had my number from before my first book was published (eBook only) by Bookbaby. And Antonio got me talking about my experience with Bookbaby. I didn’t go into all the ways Bookbaby screwed up. Not a pretty story. But I wanted the ExLibris guy to suggest how I could do a print version on my Sacred Southwest book project that would be cheaper than the $50 Bookbaby had wanted for my Utah book — the reason I never did a print on demand version of my book. That got my attention. The writing and photography were already done. Covering the 5 Utah parks in two books gets the price down to $20-$25 each. Two books means double the total possible sales. (I’m still in the hole, kids.) And a glossy photo-paper version is way more likely to get newspaper and Internet exposure. So I’m stoked to be able to finally get my book out in a print version. The challenge is now I need to do more copy editing and get the content into the correct format. Then, Arches, Canyonlands, Capitol Reef (and Moab locations like Fisher Towers) end up in book two. That approach fits geographically, the two in Southern Utah and the three in central-east Utah. Plus that breakdown gives me books about the same length. Both books will have a pile of iconic locations. And even splitting the content in two, I have tons of details on the best shoot locations, trails, composition, lighting. The plan is to keep the wording of the Intro section almost the same for both books. That’s mostly general info on landscape photography and the book format. The content for each park is totally different, so that part’s easy. The Lightroom section can be repeated in both but the example used will be appropriate for that specific park. But I don’t want these new print versions to be just like the old book. Doing a quick cut and paste for book one and two wold be way easier. But I’ve been moving more and more into a more personal blogging style in the last six months (especially with my Sacred Southwest writing) and I want some of that thinking to inform my Utah book edits. So in the last month, I’ve done a full copy edit on the text of both new books, an adjustment that is making the writing cleaner and more personal. And instead of that “explainy” guidebook style, the writing is getting more descriptive and personal — even in the photo captions. I’ve also been doing a re-edit on some of the Utah photos. Very minor touches in terms of Lightroom, a few little tweaks that give the shots more of a 3-D feel. And I’m thinking how these shots will need to display in a print book that’s landscape mode. I should be able to keep both books in the $20 range even with 80-90 pages to the book. And if you’ve got great photos, why not sprinkle in as many as you can. I’ll probably add a few more trail shots as illustrations. And in the end, these first two books could become my first steps into a new style of blog post. Kinda exciting. 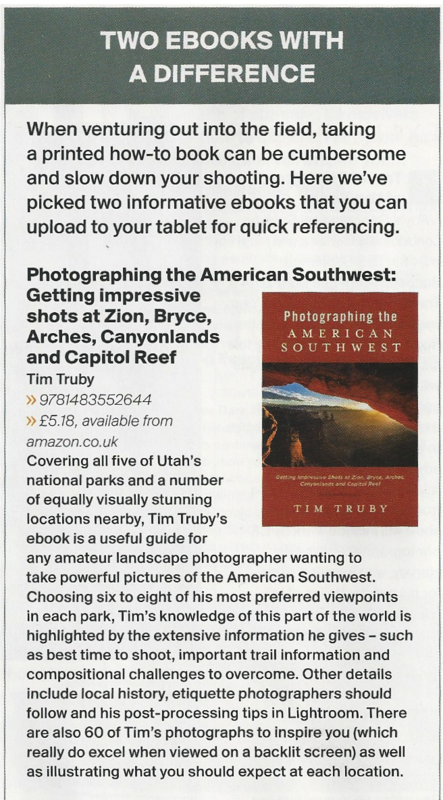 My new book on how to get better photos at the Utah national parks just got a nice review at one of the Salt Lake City newspapers, Deseret News. I’m also being interviewed tomorrow for a story in one of the Moab, Utah newspapers. Book link here. 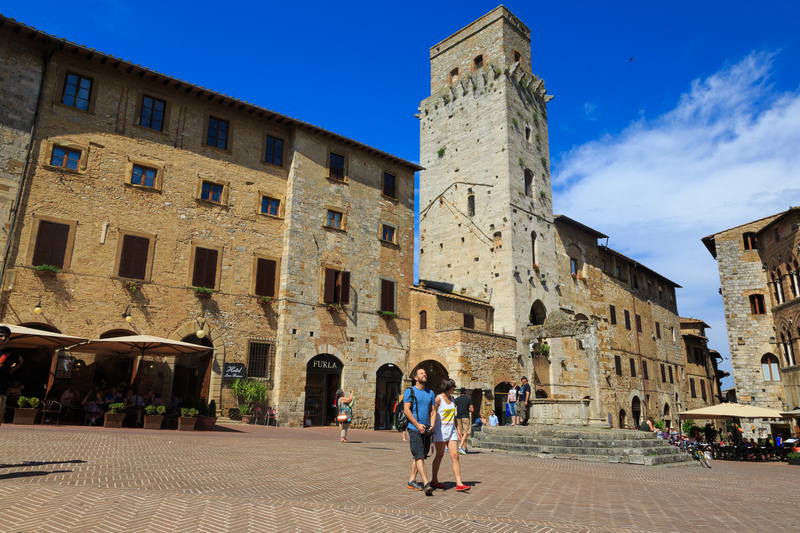 While I was in Florence I did a couple of tours with Walks of Italy: their day long tour of the city and its museums and the day trip out to Siena, San Gimignano and a gaggle of Tuscan wineries. That trip had several photo locations that are worth mentioning. The trip, like everything Walks of Italy does, was nicely organized. We all met at the Piazza della Repubblica and got to know each other. This was a 2 van group, so there were about 15 of us. All of the participants were interesting and no one who was a total wack job. Our first stop was in Florence, the Piazzale Michelangelo. This site is on the far side of the Arno River at the top of the hill. It has a great view of the city and river. Not quite as high a view as you get at the top of the Duomo, but with the river stretching out into the distance, this overlook is better laid out for photographing. A couple of the younger tour folks knew I was a photographer and told me I should come back to the overlook at sunset. They had been there the night before — along with 300 of their closest friends. I ended up taking their advice. And it’s definitely a better sunset shot than a morning one. But even the 10 AM shot isn’t bad. After that, it was on to Siena. Siena is about an hour south of Florence by bus. 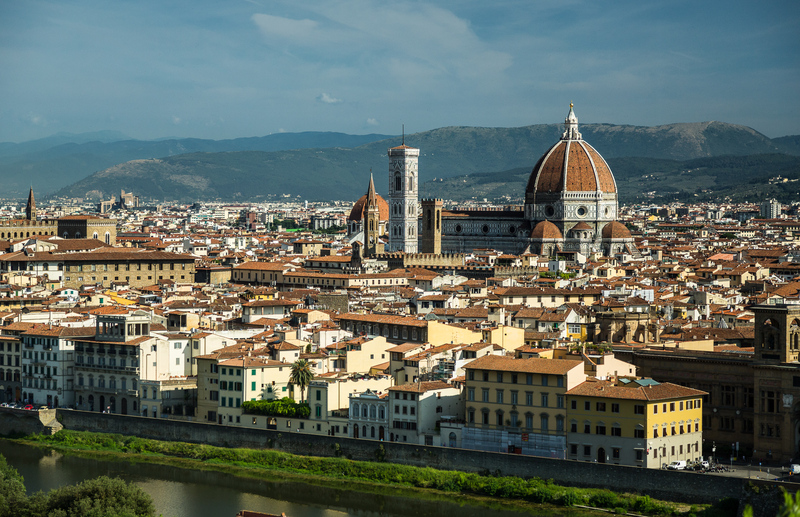 The two had been rival city-states in the Middle Ages before Florence conquered it. But that may have been blessing for modern visitors because the city center hasn’t changed much in the last few hundred years. 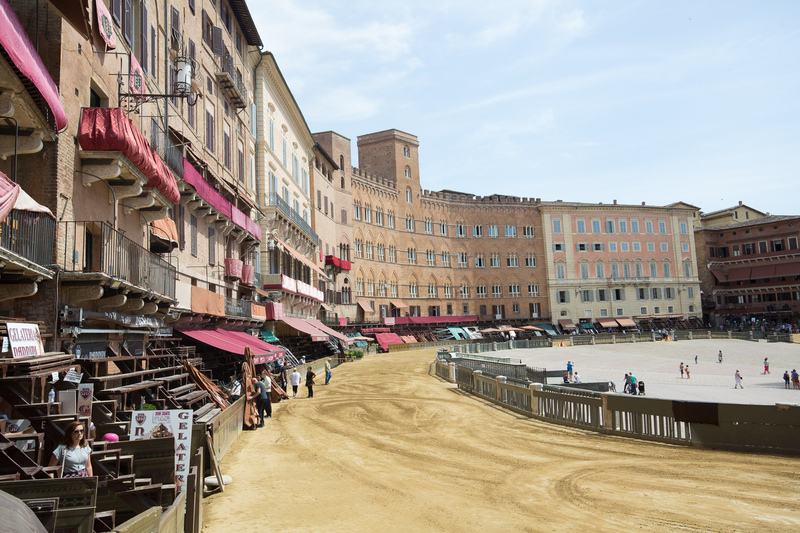 Siena still has a ginormous center square surrounded by a clock tower, ancient 5 and 6 story buildings and restaurants. The town was two days away from the big event of the year, a no-holds-barred horse race they do around the square. But the place still has a classic Medieval look — in you have a wide enough lens to capture it all. 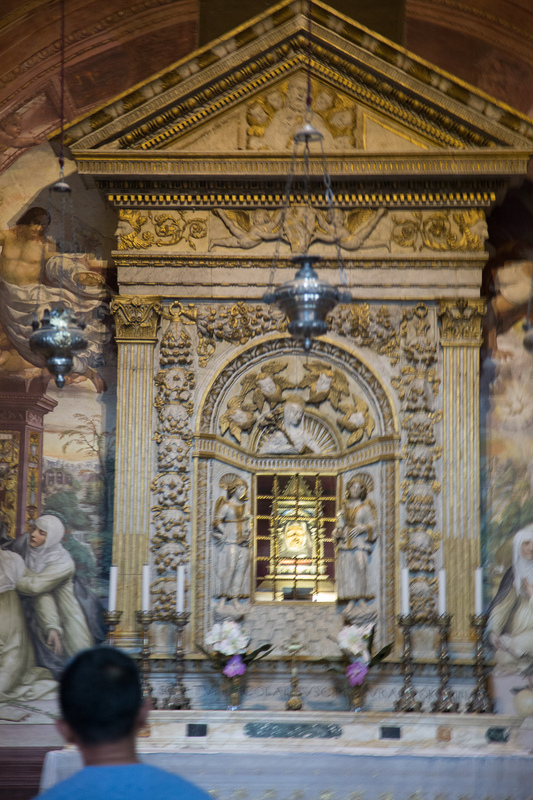 Our first stop in Siena was a church dedicated to Saint Catherine. The church isn’t much to look at on a good day. But the insides were filled with scaffolding when we were there. As a result, the only real thing of interest photographically was the place they keep the head of Catherine. Yes, they keep this saint’s head in the church. I guess worshiping body parts of holy people confers some sort of spiritual power. Yup, it’s kinda creepy – but fun. But equally weird to me, the rest of her body is in a church somewhere in Rome. Deciding who would get what body parts must have caused some hard feelings back when. 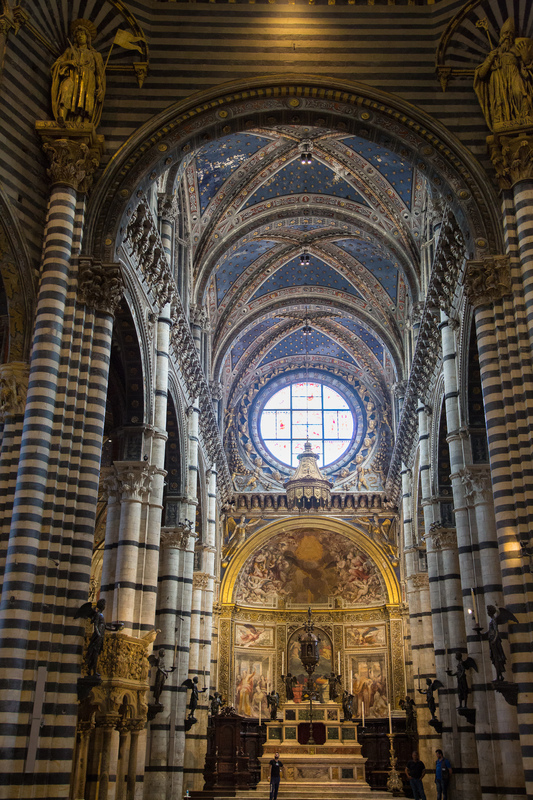 After the Saint Catherine church and town square it was onto the main event, the Siena Duomo. 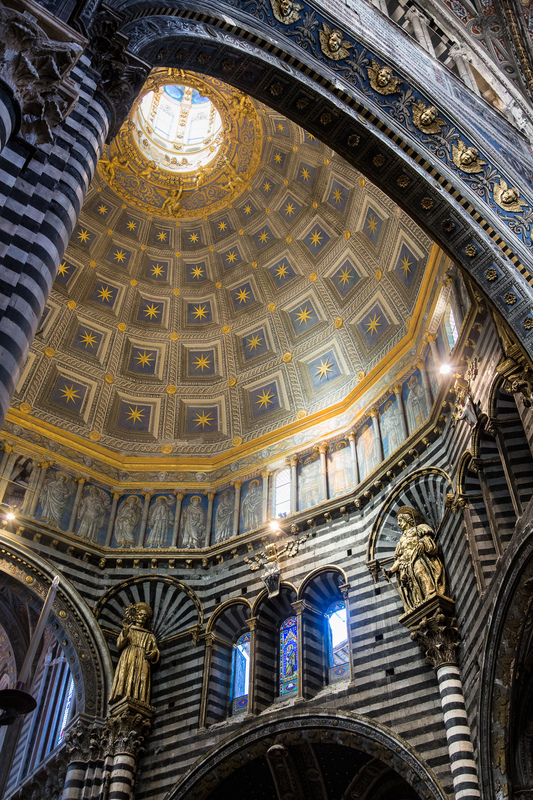 The Duomo is the city’s primary church and the name relates to it’s importance as well as to the fact that it has a huge dome. The place was built between 1220-1340. (Yes, they had cost overruns in the Middle Ages as well.) An additional section of the church was started but never finished because of the Black Plague. But even as is, the place is amazing. It’s not as large as Saint Peter’s Basilica in Rome but in my estimation this church is more interesting for a photographer than either St. Peters or the Florence Duomo. It just has so many design elements a good photographer can work with. When I find a church as interesting as this one, I approach it with the same compositional thinking I would a great landscape. There’s a vastness to the place that’s similar to what you find at a great landscape. And you can shoot the location from dozens of differing angles to pull in different foreground and background elements. — The place has a ton of great paintings and sculptures to use for this and an architecture that can set them off. The final design element of churches, the one I find most intriguing, is how the building shapes the light. These early church architects were quite brilliant in how they funneled light into a space. Their idea was to use light to suggest the vastness of the spiritual universe and the precious nature of the teaching — and encourage a deeper sense of reverence in the community. So light from the stained glass colors the light in the area behind the alter. The light coming through the dome windows filters down from above and lights the gold leaf on fire. And of course, each of the side alcoves and arms of the church has its own unique lighting environment you can play off of. For a photographer who like working with light, this church has lots of design surprises. But to me, the key principle is using the design elements and the light to take the viewer on a journey into this sacred space. Main section of the church alter with the unique blue and white striping on the columns. Notice all the different light sources. Using the light from the dome to evoke a sense of sacred space. With this shot I was consciously using the columns and statues to lead the eye to the obvious goal, just as the architects planned. I also did some Lightroom adjustments to give the gold lit dome a different texture from the stuff below. I also needed to pull back some of the blown out color in the dome’s skylight. Here I zoomed in to capture one of the more unusual design touches. Busts of every single pope (there’s over 200) line a row along the top section of the interior. 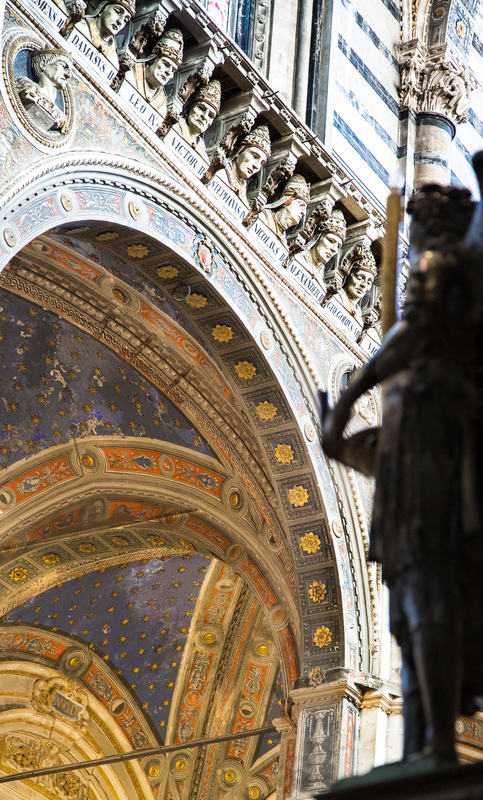 I used their faces to contrast with the blue and gold of “Heaven” that can be seen behind the arch leading the eye into the church’s left side corridor. And again, having so many superb design elements to choose from makes this church a must see. Plus, unlike St. Peter’s, I don’t believe this church has a single cherub. That’s an art atrocity that got popular during the Baroque and one I just don’t get. 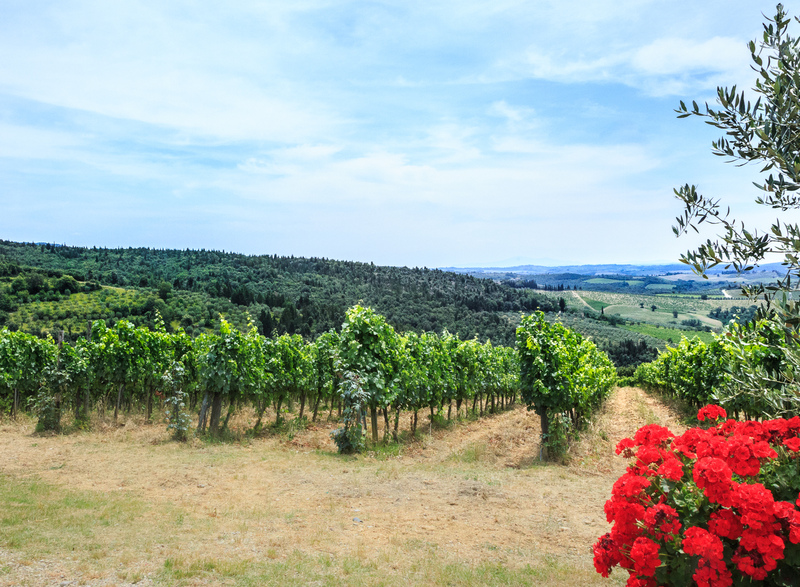 After Siena, we drove higher into the Tuscan hills for a lunch and wine tasting. I don’t remember the name of the place, but it was a perfect choice for sampling Tuscan cuisine. After the obligatory tour of the wine cellar (that included a tasting of seriously aged balsamic vinegar), we sat down to eat. These folks put out an amazing spread: cheeses, breads, their own olive oil and honey products plus a steady flow of reds and whites to taste. I’m not a wine guy so I can’t remember any of the names — except there were several that they called “Super Tuscan.” No, I’m not sure what the superhero reference means. The main course was my favorite. They served a lasagna that was to die for. Generally the problem with lasagna is that the pasta itself is so thick, it dominates the other flavors. But these guys made their own lasagna and it was about half the thickness of the stuff we’re all used to — tender with a subtle flavor. That was the best I’ve ever had. 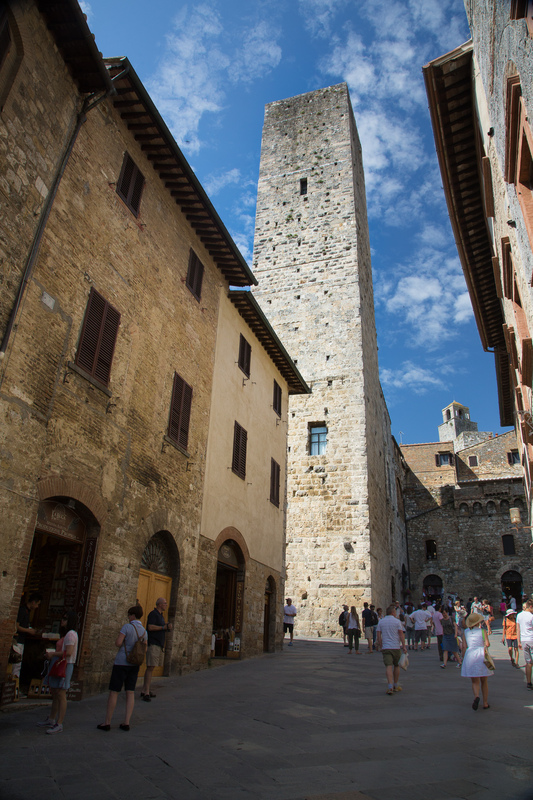 After lunch (and some major wine purchases by most of the tour), we headed further into the Tuscan hills to a quaint Medieval town called San Gimignano. The place is even more fairy tale Medieval than Siena. The old town is on top of the hill with gates and a high wall. The place is mostly one main and a few side streets that wrap around the steep location. The most interesting element in the town are these high towers. The town has over a dozen of them. They go up 3 or 4 stories above the rest of the town buildings and are clearly used for fortification. The story is that between 1200-1400 the town had some intense fighting between different families. And the families that could afford it, built these high towers so they couldn’t be attacked by rivals. Originally there were over 70 of these structures. Six hundred years later, there’s still enough left to make the place a World Heritage site. 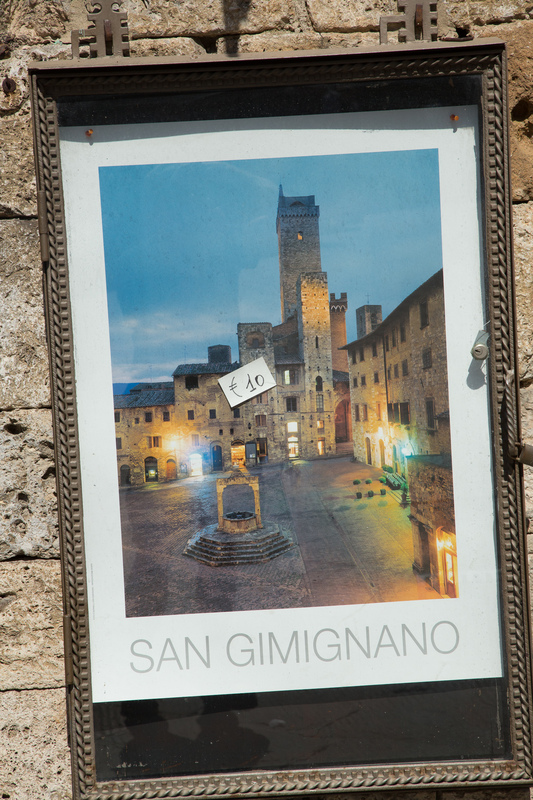 After regrouping and leaving San Gimignano, we had one more wine tasting just down the hill. The second winery tour was overkill as far as I was concerned. How about a cheese tasting for a change or a chocolate tasting, even a pesto tasting would have been more fun. But the vineyard did have a nice view of the town — if you had a good enough zoom. We were too far away for a camera phone to be effective. I finally got a shot of the old town with the sun drenching the high towers in late afternoon light. 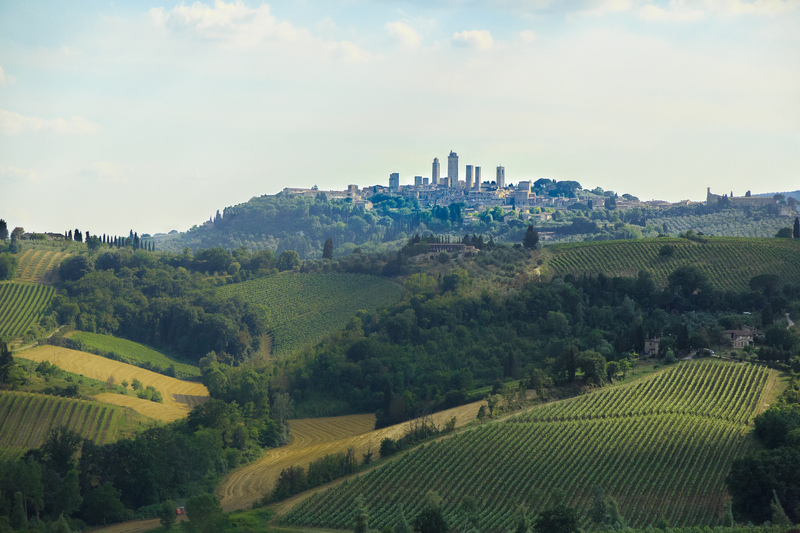 All in all a great way to get a taste of Tuscany away from the crowds and heat of Florence. And the tour also fulfilled my deeper purpose, to get an idea of what parts of Tuscany to come back to later without the tour buses.